St John's Church Merrow dating back to the 12th Century. 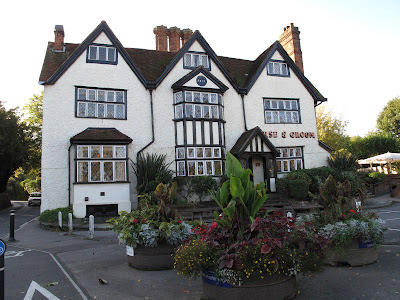 The Horse and Groom dates back to the 15th century. The church and the pub stand sentinel at the cross roads in Merrow either side of Trodds Lane which goes via Newlands Corner over the Downs to Dorking. It was once the main road. The road East to West at this junction goes from Guildford to Epsom hence named the Epsom Road. 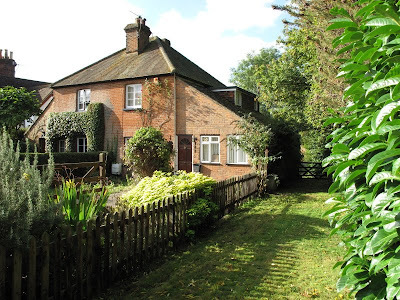 Garden Cottage is directly opposite the Horse and Groom. 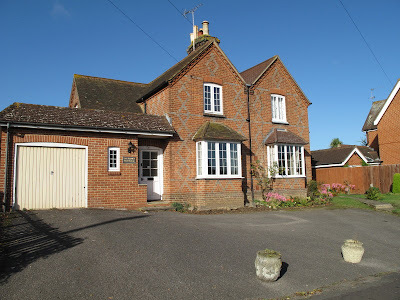 It was once used as the school house. Taken from a 1934 map with revisions 1938. 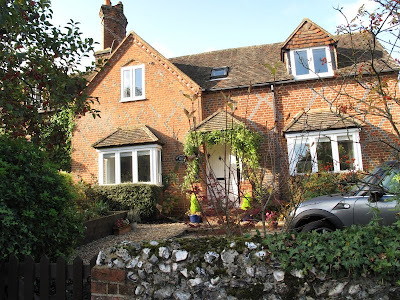 Showing Merrow Downs. At one time there was a race course on this side of the Downs between 1701 to 1870 and to the West of the Downs there was a prison of war camp during the last war 1941 to 1942. 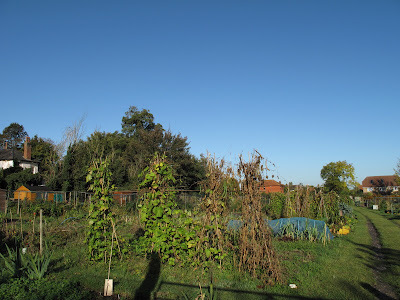 Directly opposite the Church and at the top of Merrow Street is an area of allotment gardens. 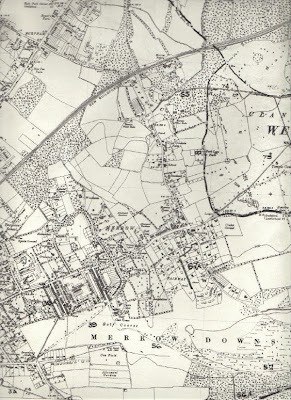 Merrow Street was the main road from the Downs to the main London Road now replaced in part by the A3. Proceeding down Merrow Street this is the entrance to The Cedars. 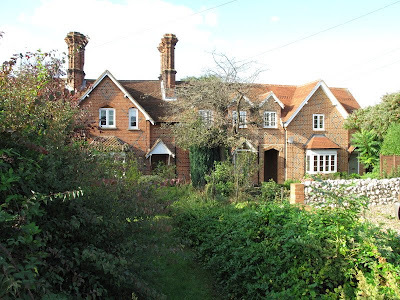 Merrow House was once the home of Miss Thrupp. Her father was Rector of St John's Church. 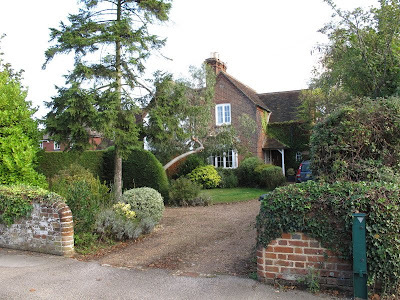 The Thrupp family owned most of the land either side of Merrow Street and lower down what is now known as Old Merrow Street. 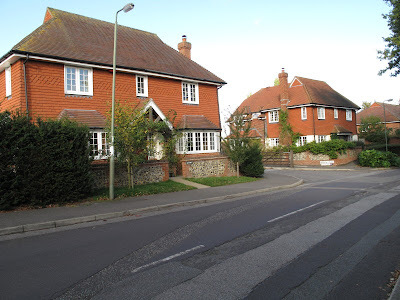 The original road being dissected by a road into a housing estate. 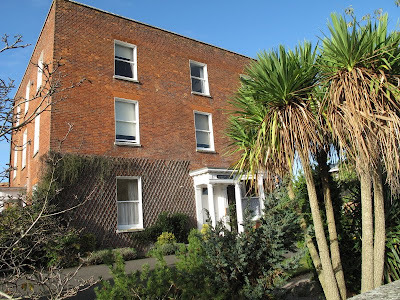 Merrow House is now split into flats and part of the Sunset homes. 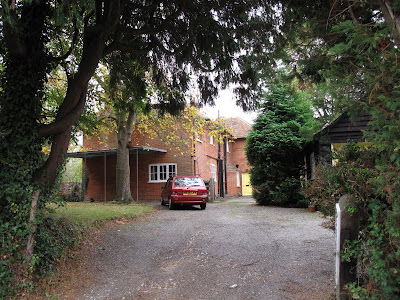 There are other modern flats too built in the grounds next to the house. Looking back up Merrow Street the hedge on the right of the photo is the boundary of Bushy Hill School. 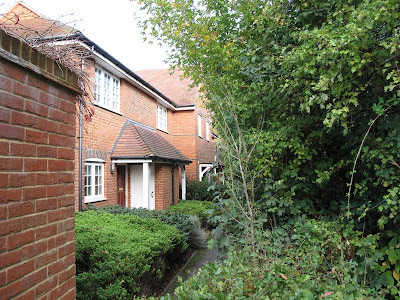 On the left is Rectory Close leading into a group of houses built in the grounds and on the site of the old rectory. 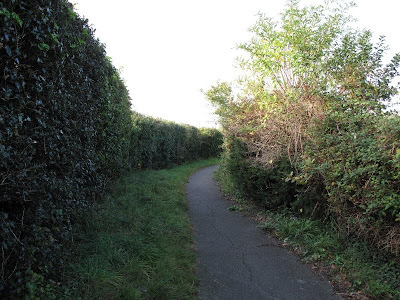 This was an old drovers way and bounds the school hedge. 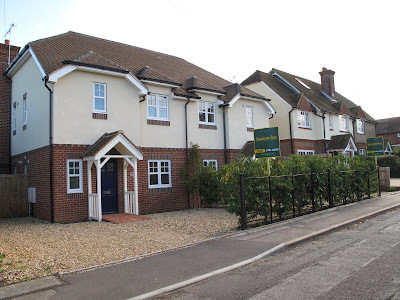 This development was on land that belonged to Bushy School, now called Merrow Place the houses have been built to replicate much of the character of the older houses. 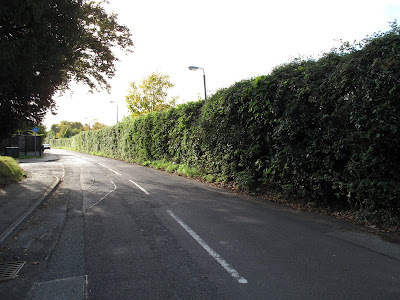 There was strong opposition over loosing the character of Merrow Street and this hedge, hence these houses Hawthorn Place were tucked away behind the hedge. Merrow Infants School a church school. 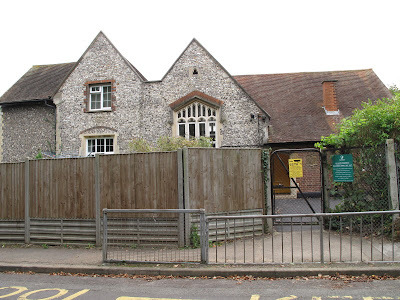 Miss Thrupp was responsible for the building of this school to replace the little one opposite the Horse and Groom. 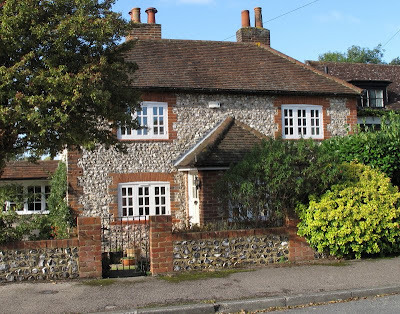 It was extended in 1901 about the time some of the houses were built. 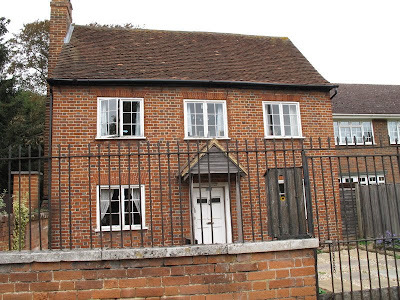 This is the style of several of the houses built around 1900 as farm labourers cottages and many of them were named after the Africa Wars. 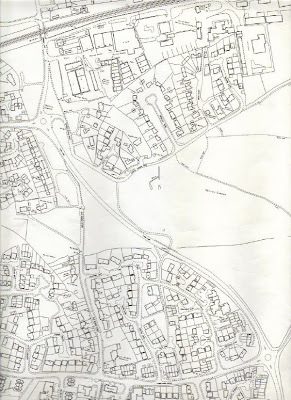 A section of map updated since the Merrow Park development which started early 1980's. 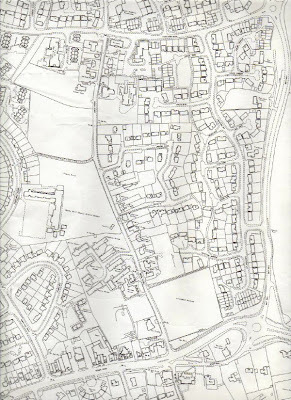 The church is at the bottom right at the junction and at the top of the map Merrow Street ends in a cul de sac where Kingfisher Drive crosses into the estate. Across Kingfisher Drive into the next section of the old road this is now known as Old Merrow Street. 1 Peace Cottages with its majestic chimneys. There was previously a building on this site which was the old bake house. When it was demolished the bricks were reused in building these. 2,3 &4 Peace Cottages originally three cottages they have been sympathetically extended on the left to make a larger cottage and on the right to build a fourth cottage. Pound cottage. The Pound was once in the garden and this is where stray animals would be brought. 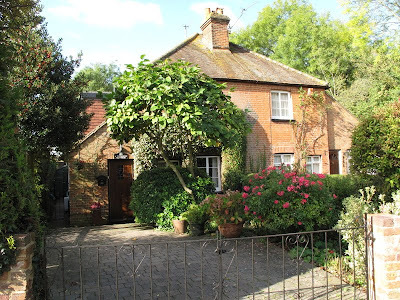 Pound Cottage was at one time used as the Laundry. This is the next section of the map showing where Kingfisher Drive crosses at the bottom and the railway in the top corner. 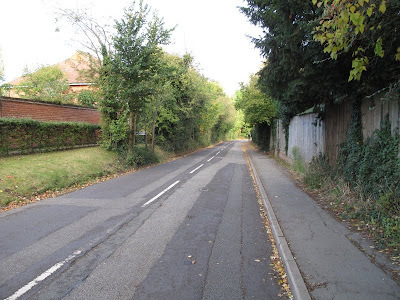 The bottom of old Merrow Street is also now a cul de sac and the new road replaces this lane. At the top right this side of the railway is where the old brick works used to be. 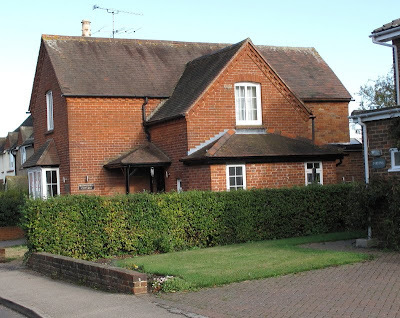 The bricks from there were used for building many of the cottages. 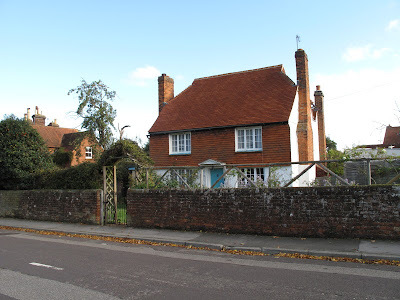 Of course there are several other modern houses scattered in amongst these old cottages. 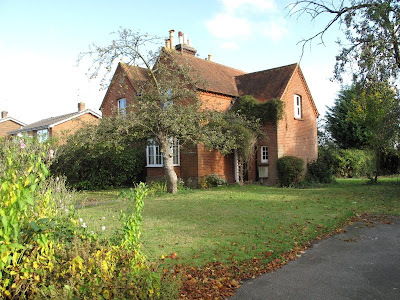 More information on Merrow can be found through visiting Merrow Residents Association website. Haven't been that way for years. Fascinating. Dear Joanne, it is me, Pauline. Are you trying to make me homesick, teehee! Loved all your pics.....and remember the last time when I was back home, I walked my old stomping grounds everyday, and I took these kind of pics. Oh, England does have it's charm, set apart from any other nation. Anyhow, not properly back yet in blogland, but hope to be soon. Been living a roller coaster but, I think we are winding down now. I have checked your blog now and again to keep in touch and I have enjoyed my quick visits. 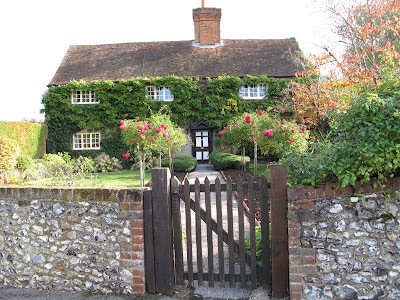 You have a beautiful English property, garden and home. I hope to be back in cyberspace soon and into blogging which was a fun part of my life. Working on some "stuff" - soon tobe done, then back into blogging again. Tatyana So glad you enjoyed the post and it brought back memories. Azplantlady I am glad you enjoyed the trip a little different than gardening but in fact many of the gardens are worth photographing in their own right just hadn't got the space. Pauline How great to hear from you. I had you in mind to e mail these last two days must be psychic. I look forward to an update on your lovely garden which I have missed and also photos of your trip. I hope you enjoyed cycling around your neighbourhood to take these pictures as much as I have enjoyed looking at them. 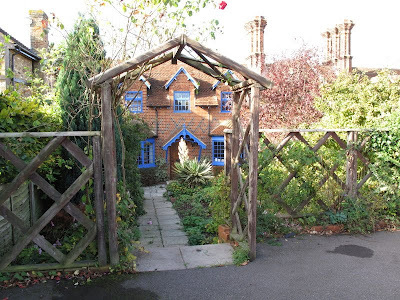 I love picture of the house framed by the gateway. I am enjoying being able to cycle again I would never have believed it a couple of years ago. It was great speaking to you on the phone perhaps we should get webcams so we can chat across the pond. What a great post. I loved the tour of Merrow. there is sure a lot of charm and interesting buildings there! What a wonderful place to visit! 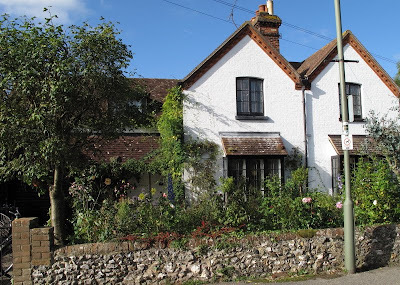 English cottages are always so interesting, and of course the English gardens are so beautiful! Here in the US we really don't have anything that old so it is always fascinating when we do see it! Gorgeous, my goodness I am jealous of where you live, picture postcard prefection everywhere you look. I would do a tour of Carrickfergus but somehow I think it would look very bad next to Merrow. Nice picture, remind me of Fraser's Hill in Malaysia. Country where I come from. We 've almost similarity old bungalow that are still existing in Fraser's Hill. Some are well maintain if it's belong to private corporation. But if the bungalows belong to government of Malaysia well I can tell you it is badly maintain. Most of the bungalow that are well maintain who has the Hainanese (Chinese) caretaker that can clean and cook. That all I can say. Good Day. I am super enchanted by your post! I definately feel like I have been on a wonderful journey!Thankyou for taking me on a magical trip and sharing such gorgeous photos and info! Lovely! Thanks for all the lovely comments. 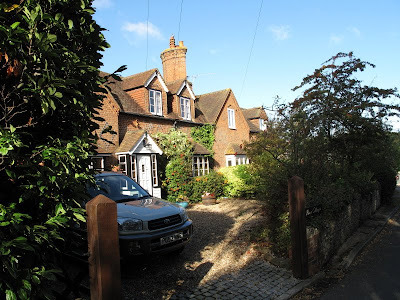 Of course the camera lies I only chose the cottages I like not all the modern ones scattered amongst them. Also I have just figured out how to change my template to stretch the page I am dumb when it comes to IT. Do let me know if it causes a problem for reading it. So many cottages with such good names. We don't do enough of naming of houses in the US. Adds to their character. 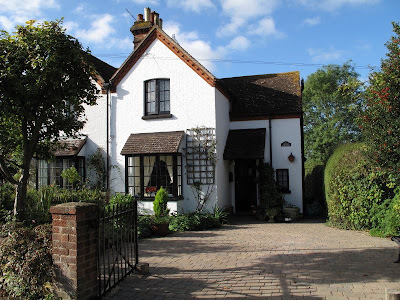 Your post gives such a good picture of English architecture and the preservation of it in today's England. Thank you. 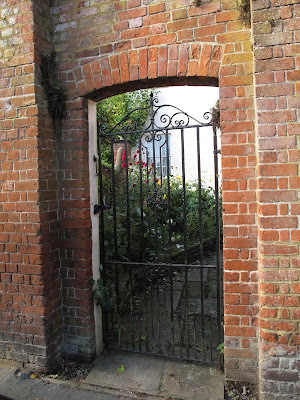 I have just come from Carolyn's blog "Aiken House & Gardens" and I see you live in Surrey too!! 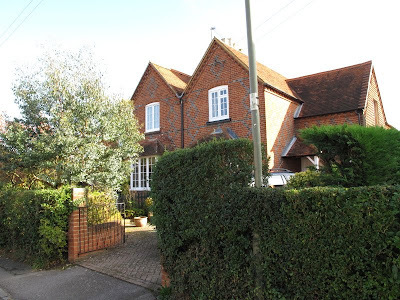 My husband had a flat in Merrow when I met him in 2001, when we married in 2002 I moved from a cottage overlooking Twickenham Green to where we now live. We too enjoy visiting gardens and like you Wisley, which isn't too far away! I hope you will pop over and visit my blog. Thank you, I enjoyed this tour. 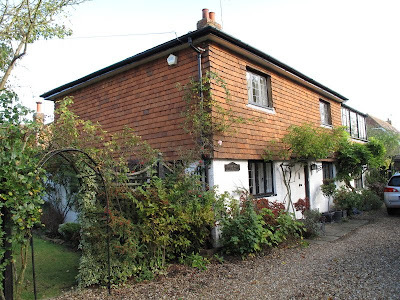 I love old cottages anytime, but have to be with modern conveniences. Hi - love your blog. 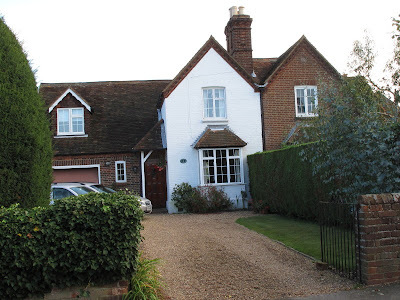 Found as I was searching for MERROW HOUSE - I'm doing research into the Thrupps who are in my husbands family tree - not read it all yet but can empathise with you as I am housebound with ME/CFS at present. Keep up the good work of recording all these lovely places. How nice to hear from you and have fun searching your husbands family tree. 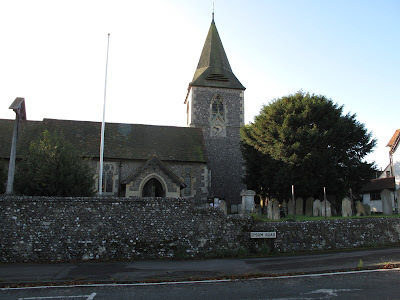 A friend of mine from Canada visited and busily photographed some of the gravestones in Merrow Church she then adds them to a site for people to look up family history. Sorry to hear about you having ME/CFS have a look at my other blog link at the top Looking at Lyme Disease there is a lot on there about recent developments with ME/CFS that would interest you. There is increasing evidence that about 30% of people with ME/CFS actually have Lyme Disease as was the case with me so it is well worth having a good read of some of my links. My e mail is in my profile if you want to have a chat. Thanks for the friendly reply Joanne. Found the Thrupps fascinating - they have a huge listed tombstone in London - some are buried at St John's in Merrow in a large vault - but not tracked down a picture yet! If my conversion from the web correct Adelaide Thrupps's will would be worth over 8 million today - none of it came our way though! 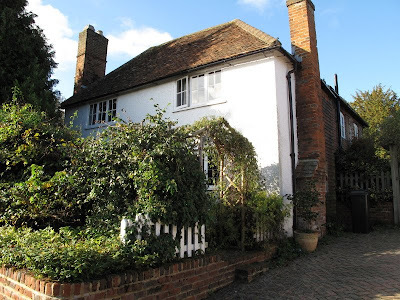 Been doing something similar to you in that I've taken old pictures of our village and tried to get modern day 'now' shots and done blogs too - amazing what can be done from home these days. 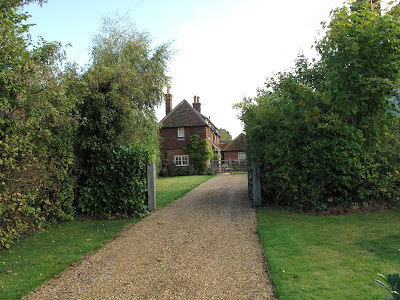 Ruth I contacted my friend Alison here is the link to the Graveyard ener thrupp in the surname and it will bring up several. If you want to e mail me I will give you Alison's e mail and she will send you a higher resolution photo of the grave/s. Hi Frank how nice to hear from you, you will have seen some changes over the years in Merrow Street and what is now called Old Merrow Street. Do call and say hello when you are next passing this way.